Mount Moriah Lodge is the namesake of Mount Moriah, the mountain on which, according to the Jewish historian Josephus and Jewish tradition, Abraham offered to sacrifice his son Isaac as an demonstration of his faith in God. In the Biblical account of Genesis 22, Abraham sets out to obey God's command to sacrifice Isaac without questioning. 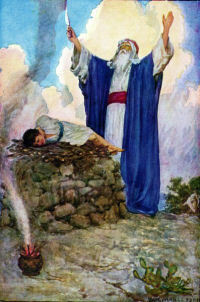 After Isaac is bound to an altar, the angel of the Lord stops Abraham at the last minute, at which point Abraham discovers a ram caught in some nearby bushes. Abraham then sacrifices the ram in Isaac's stead. Mount Moriah is also the location of Solomon's temple, which was on the spot that had been the threshing-floor of Ornan the Jebusite (2 Samuel 24:24, 25; 2 Chronicles 3:1), and is the current Temple Mount in Jerusalem. It is also the site, one thousand years after Abraham, where David built an altar and offered sacrifices to God. Mount Moriah contains the Foundation Stone, which was the center of the Holy of Holies--the Most Holy Place (Kodesh Hakodashim)--the inner sanctuary within the Temple and is the holiest site in Judaism. The Foundation Stone is currently housed within the Masjid Qubbat As-Sakhrah, or "Dome of the Rock" mosque.